A man in a black suit kissing a woman in evening black dress, wide smile, happiness, in a white room with fireplace and christmas tree. Woman in evening black dress shakes a gift, big smile, in a white room with fireplace and Christmas tree. Happy Man in Suit and Woman With a Wide Smile in evening dress knocking glasses in a white room with fireplace and Christmas tree. Woman in Evening Black Dress Talk in His Phone the man in the black suit in a white room with fireplace and Christmas tree. a Man in a Black Suit and a Woman in Evening Black dress waving sparklers, in a white room with fireplace and Christmas tree. Happy Man in Suit and Woman in Evening Dress Hold glasses in a white room with fireplace and Christmas tree. 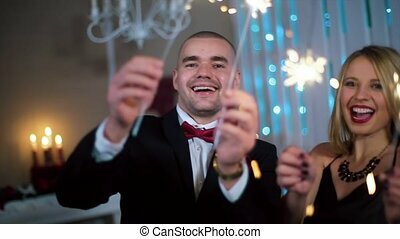 a Man in a Black Suit and a Woman in Evening Black dress dancing with sparklers, big smile, in a white room with fireplace and Christmas tree. Happy Man in Suit and Woman in Evening Dress Champagne explosion in a white room with fireplace and Christmas tree. Woman in evening black dress makes self on the Smartphone the man in the black suit in a white room with fireplace and Christmas tree. 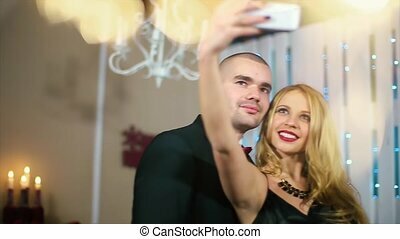 Woman in evening black dress makes selfie on the phone the man in the black suit in a white room with fireplace and Christmas tree. Man in Black Suit Giving Woman in Evening Dress black gift with red ribbon woman shakes gift in a white room with fireplace and Christmas tree. Woman in Evening Black Dress Makes Photo on The phone the man in the black suit in a white room with fireplace and Christmas tree. 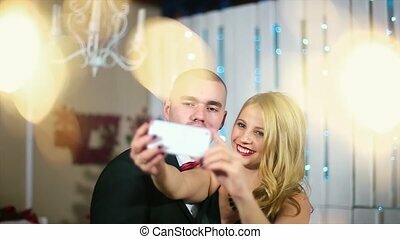 Happy Man in Suit and Woman in Evening Dress knocking glasses burn berals lights in a white room with fireplace and Christmas tree. Man in a Black Suit Gives a Woman in Evening black dress a gift with a red ribbon the woman a broad smile in a white room with fireplace and Christmas tree. The woman in black evening dress takes photos with her phone a man in a black suit kisses her lips in the white room with the fireplace and Christmas tree.